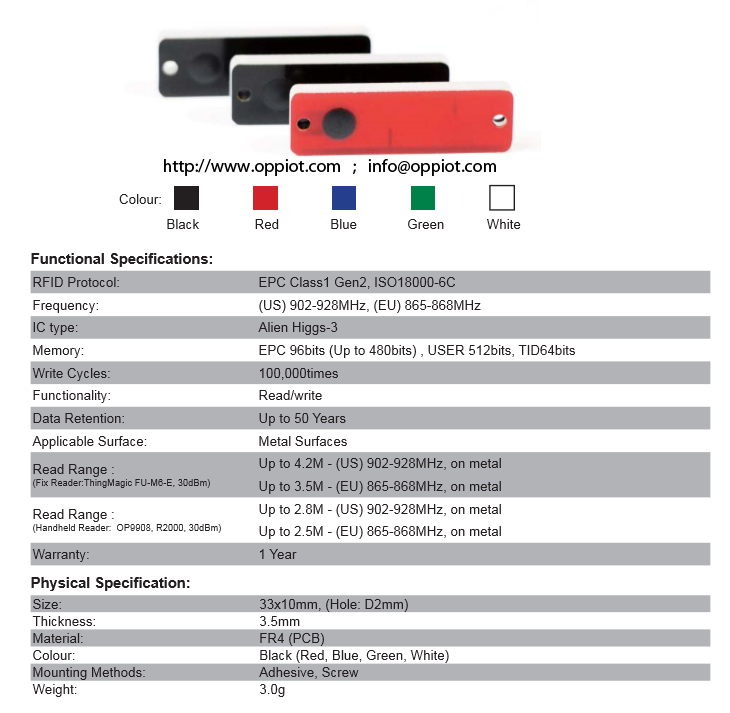 OPP3310 is a truly passive UHF radio frequency identification(RFID) transponder that delivers superior performance on a variety of surfaces including plastic, wood and metal. The tag, available in both EPC Global Class 1, Generation 2 (Gen 2) and ISO 18000-6C protocols, combines an impressive range with a rugged yet compact package designed for harsh industrial applications and temperatures ranging from -40℃ to +150℃. 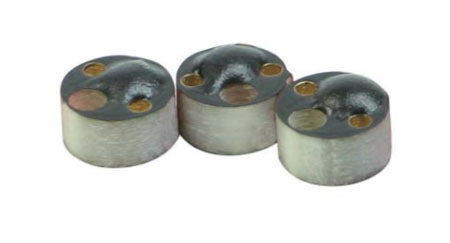 Resistant to multiple cycles of one hour at the temperature of 250℃. OPP3310 has a wide band antenna design, which has excellent UHF range performance. The EPC Global Gen 2 version of the UHF Rigid Tag has 96 bit of EPC memory and 512 bits user memory. Additionally, the tag has a robust physical package and is designed for exposure to substances and harsh chemicals representative of typical industrial applications, including machining oil, gasoline, motor oil, methyl ethyl ketone (MEK), isopropyl alcohol, methyl alcohol,mineral spirits, acetone, and kerosene. Radio Frequency Identification is a ideal technology for tracking assets. RFID tags are the simpler way to track them. Every tagged asset can be tracked by reading the upcoming radio signals from each tag. Our asset tracking tags enable you to instantly get the general location of tagged objects anywhere within a specified space. Asset tracking allows you to monitor the status, location and availability in your extended operations; manage your assets on demand by knowing where they are and boost production by getting your assets where they need to be without delay. Integrate your business processes with on demand knowledge of work-in-process manufacturing, and make more informed decisions. Asset tracking can be used in various industries like baggage handling, parcel handling, supply chain, service industries, distribution logistics and manufacturing companies to identify goods & objects in an industrial environment.RFID Industrial Asset Management is a powerful tool to boost business activities for the maximum profits. Passive Ultra High Frequency (860-960 MHz) tags have the longest read ranges of all passive tags (up to 15 feet, sometimes more). They are most commonly used for inventory control and supply chain management of goods, parts and materials, and for case and pallet tracking in retail, manufacturing, pharma, logistics, military and other industries. Passive UHF tags are also used for asset management that includes computer and IT asset tracking, furniture, equipment, uniform and laundry tracking; and returnable asset management in manufacturing, healthcare, logistics and other industries. Passive tags can be also used for personnel tracking, patient tracking and event management. Passive tags in very small form factors can be also used for anti-counterfeiting. Within passive UHF there are also Near Field tags that utilize the near field and these have read ranges only a few inches. Their advantage is usage of same protocols and frequency as far-field UHF combined with good penetration of liquids and moist materials and short read range. What is UHF RFID Label and UHF RFID Tag? We’ve redesigned the UHF RFID label from the ground up to save you money without compromising performance. A battery-assisted passive has a small battery on board and is activated when in the presence of an RFID reader. The RFID tag receives the message and then responds with its identification and other information. Since tags have individual serial numbers, the RFID system design can discriminate among several tags that might be within the range of the RFID reader and read them simultaneously. UHF RFID label contain at least two parts: an integrated circuit for storing and processing information, modulating and demodulating a radio-frequency signal, collecting DC power from the incident reader signal, and other specialized functions; and an antenna for receiving and transmitting the signal. The UHF RFID tag includes either fixed or programmable logic for processing the transmission and sensor data, respectively. The UHF RFID tag can be affixed to an object and used to track and manage inventory, assets, people, etc. UHF RFID offers advantages over manual systems or use of bar codes The tag can be read if passed near a reader, even if it is covered by the object or not visible. The tag can be read inside a case, carton, box or other container, and unlike barcodes, RFID tags can be read hundreds at a time. Sewn-in UHF RFID label in garment manufactured by the French sports supplier Decathlon Front, back, and transparency scan. RFID provides a way for organizations to identify and manage tools and equipment, without manual data entry. UHF RFID label are widely used in identification badges , replacing earlier magnetic stripe cards. The RFID antenna in a permanently installed coupling half unmistakably identifies the RFID transponder placed in the other coupling half after completed coupling. The coupling’s location can be clearly identified by the RFID transponder coding. In many countries, OPP IOT RFID tags can be used to pay for mass transit fares on bus, trains, or subways, or to collect tolls on highways. Implantable RFID chips designed for animal tagging are now being used in humans. Author rfidchip_@2016Posted on September 27, 2017 Categories OPRFID Technologies, RFID TagTags What is UHF RFID Label?, What is UHF RFID tag?Leave a comment on What is UHF RFID Label and UHF RFID Tag? What is UHF passive RFID tag? Selecting the proper RFID tag can be difficult because there are literally thousands on the market today. So how do you figure out what kind of tag you need? The selection process starts with the RFID chip. Your business’s data requirements will determine the kind of chip you need because the chip’s capacity must provide the proper amount of data in the proper format. Then you should select the RFID inlay. This process depends on the physical properties of the product to which you want to apply an RFID tag. The antennas on individual inlays are designed and tuned to specific materials. Antennas will have different designs if the inlay is being applied to metal or glass versus cardboard, and different yet again for materials with a high liquid content. There are near-field antennas that provide short-read ranges versus full-field, long-read range antennas, depending on your requirements. It is highly advised that you consult an RFID professional to ensure that you select the right tag for your application. Where do I place the UHF tag? Once you’ve chosen the right tag, the challenge becomes selecting the ideal location to place the tag on the targeted item. Regardless of what the item is or what it’s made of, proper tag placement depends on how the item traverses the business process and where in the process the tag needs to be read. With this knowledge, which is typically obtained in an RFID site survey, the tag can be optimally placed to ensure that it is read. When you’re implementing your RFID project, don’t forget to consider how you’re going to apply your passive RFID tags to your target object. There is a cost associated with this, and in some applications, it can be significant. For example, if you’re implementing an RFID asset tracking application, you need to install an RFID tag on each asset (typically a permanent tag). Depending on the number of assets and where they reside, implementation could be expensive. This cost needs to be figured into the overall project. Author rfidchip_@2016Posted on September 26, 2017 September 26, 2017 Categories RFID TagTags What is UHF passive RFID tag?Leave a comment on What is UHF passive RFID tag? This UHF RFID tag is compliant with EPC class 1 Gen 2 and ISO18000-6C protocols and offers a long read range of up to 6.5 meters on metal. OPP8008 UHF tags applcation in Bulk container tracking, Vehicle tracking, Post-paint oven baking, Medical equipment tracking,Tool tracking, WIP conveying equipment, IT/telecom management, Instrument tracking, Weapons tracking. RFID Tags assist in Automatic Vehicle Identification (AVI) and Vehicle Tracking. Commercial vehicles as well as personal vehicles need to be identified and tracked for secure access to gated and controlled parking areas. RFID enabled Windshield Tags are placed on the windscreen of the vehicles which can be read when the vehicle passes through a RFID enabled gantry or parking lot gate. RFID technology allows for easy and fast communication between tag and reader. This helps in allowing access to a vehicle to a secure gated parking lot, automates billing and electronic collection of parking fees, and eliminates scope of misplacing parking tokens/tickets. OPP IOT Windshield tags are tamper-proof which eliminates scope of theft of these tags. Any attempt to transfer or shift the tag from one vehicle to another vehicle causes the tag to lose its functionality and this helps in accurate automatic vehicle identification. Higgs-3 operates at extremely low power levels yet still provides sufficient backscatter signal to read tags at extended range. It can also be programmed at low RF power and, in conjunction with a custom command – LoadImage – be programmed at high speed. Higgs-3 is implemented in a low cost CMOS process and uses proven and cost effective EEPROM technology. Higgs-3 offers a flexible memory architecture that provides for the optimum allocation of EPC and User memory for different use cases such as legacy part numbering systems and service history. User memory can also be read and or write locked on 64-bit boundaries, supporting a variety of of public/private usage models. OPPD6 On-Metal Tags UHF are constructed with FR-4 materials and rated IP68 for high reliability and durability in all types of environments including outdoor waterproof,strong acid,strong base.It was proved to use over 50 years in outside. It integrates the latest IC technology to deliver the industry’s best performance and memory size while conforming to EPC Class 1 Gen 2 specifications. RFID tags use radio waves for the purpose of tracking and identifying your assets. Whether you need to track metal parts, components in chemical baths, injected molded plastics, palettes, or containers, our rugged OPP IOT RFID tags deliver reliable performance. Our RFID tags can be custom made and programmed to match your system’s data and are available with your logo and message. With the ability to read longer distances, RFID tags are perfect for marking any mobile object. Our OPP IOT series of RFID tags have been fully tested to mark all your challenging applications. With the widest selection of RFID tags available, you have the ability to mark metal and non-metal surfaces with great readability. OPP IOT specializes in UHF RFID tags and passive RFID tags. Our Gen2 UHF rfid tags are guaranteed to work with most industry-standard readers. If you have not already chosen a reader or integrator, OPP IOT’s RFID experts can introduce you to our experienced and tested partners who also specialize in UHF and passive rfid tags.